Willard High School students Francie Barber, Kiyana Guerrero and Dylan Conat, from bottom, work on a mural on the side of the Elite One Nutritional Services building on Tuesday. The mural, created by Willard students, teacher Gwen Hoppe and artist Stephanie Frostad, was begun in 2014 and will soon be complete. Willard students Octavia Alexander, Dylan Conat, artist Stephanie Frostad, and students, Shaun Baird, Francie Barber and Kiyana Guerrero, from left, paint sections of the mural that faces the Bitterroot Spur Trail. The mural depicts native Montana plants, flora and animals. 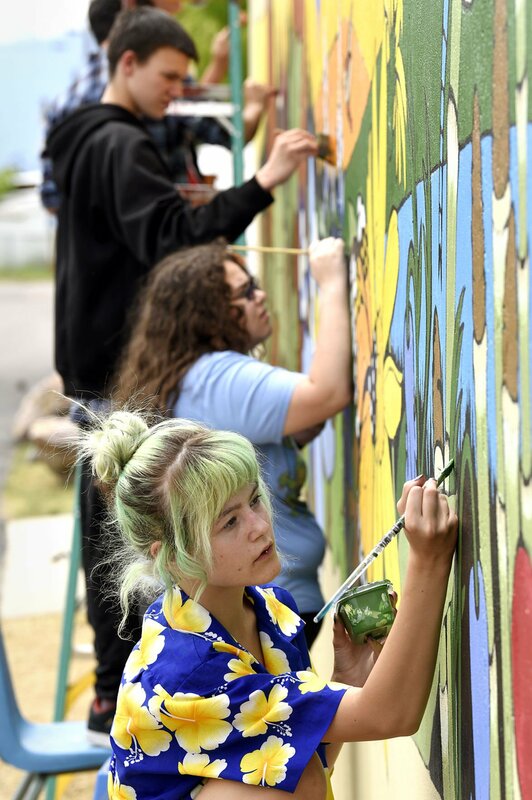 As Willard High School students worked on the Bitterroot Spur Trail mural Tuesday, a biker whizzing past called out a compliment. "We get that all the time," said Stephanie Frostad, a Missoula artist. "Sometimes we get people calling out the Latin names of some of the plants in the scene." Frostad has worked with the Willard students on the mural since 2014 when she was recruited by Willard art teacher Gwen Hoppe. Hoppe was approached by Elite One Nutritional Services because the company's building had been vandalized more than once with graffiti. The company thought the mural would be a good deterrent, Frostad said. It appears to have worked. The wall is now covered with paintings of native Montana plants, flora and animals, all sketched out by students. Missoula Parks and Recreation wanted the images to be of native species, Frostad said. Since the first mural began, each year Hoppe's students have made additions. But there is no more space for another mural section, so Hoppe's students will have to find a new project next year. She already is working to find a new art project where the students can make something that beautifies the community. "It's good for students to contribute," Hoppe said. "They can do wonderful things." Each student was asked to sketch a native species from Montana, and Frostad took those sketches and incorporated them into the larger mural sketch. Dylan Conat, 16-year-old sophomore, sketched a pine cone, which hangs up high in a tree. Frostad then projected the mural onto the wall and she and students sketched it with graphite. She assigned colors to sections of the mural, making it like a giant paint-by-numbers. Sophomore Francie Barber, 16, was in charge of everything green on the newest mural, in keeping with her green hair. "I'm much happier when everything is green," Barber said. Most students enjoyed the project. Octavia Alexander, a 14-year-old freshman, skipped her last periods to keep painting. The collaboration of the project was something she enjoyed. Cathy Tabish, who works for nutritional services in the building the students had painted, enjoyed seeing the progress the students made each day. Tabish was a Willard student when she was younger, though the school had a different name then. Her kids also went to the school. "It's amazing what they are doing," Tabish said. "To do something on that scale, it is pretty incredible." The mural brightens up the otherwise bleak building, Tabish said. More murals around Missoula would be good for the town, she said. Things like the painted power boxes in the downtown are good for the community, she said. The project will be concluded in the next few weeks as the students, Frostad and Hoppe put the finishing touches on the mural, including a graffiti-repellent layer. "The students played a huge part in every element," Frostad said. "It gives them a strong sense of ownership." One audition, and Jackalynn Snow was hooked.